The terminal/large depot (referred to as terminal) is a storage area where petroleum products are received through cross-country pipeline or large ships and stored in tank farms. The distribution is carried out using trucks, rail, pipeline or similar means. Yokogawa has accumulated more than two decades of experience in the automation of such terminals and supplied its Terminal Automation Solution to suit varying customer needs. Yokogawa offers focused solutions that address customer operational issues and improves accounting accuracy, asset, inventory and energy management, as well as control, safety systems and information visualisation across geographical dispersed terminals. Terminal Logistic Suite VP (TLSVP) is an advanced software solution that performs the applications of truck loading, ship loading/unloading, tank car loading, inventory management (loss/gain, reconciliation, result management), stock management, master data management, security control and audit trail, and other movements operations (e.g. pipeline transfer). Yokogawa’s TLSVP is designed and developed to meet the operational demands of main oil, fuel and chemical distribution terminals applicable to oil, LNG, LPG and petrochemical/chemical terminals. TLSVP manages the complete ordering procedure from assignment of order for loading/transferring to monitoring and control of loading/transferring procedure. The unique nature of Yokogawa’s TLSVP is its ‘adaptability’ to the customer’s environment, which has been achieved by building the system functions using modular blocks, where any individual block could adapt itself to the project specific requirements. 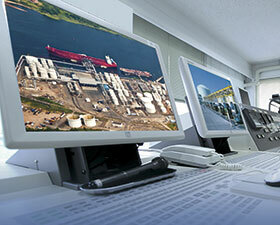 • Comprehensive coverage from terminal business management to automation systems. • Seamless integration with Yokogawa Prosafe-RS system that provides Safety Instrumented System (SIS) and Fire and Gas System (FGS) functions. • Integrates with SAP and other ERP systems. • Various interfaces for subsystems such as tank gauging, MOV controllers, card readers and weigh scales. • Physical and book inventory management and reconciliation function. • Terminal Operation Support Service to store and distribute products, as typical terminal operations must account for the ownership of products with multiple owners and customers. • SQL server as open database management system. • High reliability associated with DCS and easy engineering using templates. • User-friendly operation using Windows as the GUI. • Batch and sequence of ship, truck and rail loading. • Consolidated Alarm Manager based on EEMUA 191 guidelines. • The control network (Vnet/IP) uses a 1 Gb/s, open control network that guarantees operator screen update times within 1 second. • Low cost of ownership: maintenance is less frequent, software upgrade is easy, expansion is smooth and even revamps are speedy. • Seamless integration with Yokogawa’s Asset Manager, Batch, Plant Information Management System, and SIS. In industrial plants there is increased concern about potential incidents that can affect people, assets and the environment, in and around the plant. A SIS can dramatically reduce the risk of accidents in the plant. The SIS required for import and storage terminal projects is based on Yokogawa ProSafe RS, which is IEC/TÜV certified. It provides shutdown and protection for all plant safety related operation, which extends to process, equipment, personnel and the environment. It performs process unit shutdown, equipment protection, sequential start-up and programmed shutdown, emergency plant depressurisation, etc. SIS actions are initiated by process input, emergency shutdown button (hardwired), and shutdown/start-up signals from the DCS or other systems. ProSafe RS is dual-redundant SIL 3 SIS, integrated with Centum VP DCS on the Vnet/IP control network to put an end to control and safety system integration incompatibility. This seamless structure realises true integration while reducing time and cost to implement process safety. Alarms and events are integrated with the DCS alarm and events messages with a real-time 1 ms event resolution on the Sequence of Events Recorder (SOER) function. ProSafe RS system features physical redundancy through dual CPUs with dual circuits on each card, physically redundant I/O modules, redundant power supplies and redundant communication. The system is SIL3 certified by TÜV, even when used in single configuration, and complies with the growing influences of functional safety standards such as IEC 61508/61511 and ANSI/ISA S84. ProSafe RS is a true implementation of ‘one process, one network, one window, one solution’ concept. With the release of the new Centum VP R6 and ProSafe RS R4, a solution platform that exceeds the capabilities of conventional production control systems, customers can take full advantage of new features like N-IO (Network-I/O) providing decoupling of hardware and software, and the new Automation Design Suite. The functionality of the new release of Centum VP enables the convergence of all Yokogawa’s strengths, providing an exciting environment where innovative methods provide completely new ways of cost saving and value generation. Agile Project Execution is Yokogawa’s methodology for executing all projects in a cost-efficient manner that eliminates waste. This results in improved operating efficiency, but also applies to a reduction of waiting time on a project, space optimisation, etc. For information visualisation solutions across geographically dispersed terminals, Yokogawa’s scada systems/applications combine high-performance, high-availability, broad scalability and platform independence in a manner that maximises ROI while minimising TCO over the entire system lifecycle. Originating as the Flexible Advanced System Techniques (FAST) project, FAST/TOOLS today is a comprehensive, fully-integrated scada application suite. Powerful and flexible, it serves installations ranging from 50-point unit processes to multimillion-point offshore production pipeline and terminals that extend over thousands of kilometres. Yokogawa’s system platforms combined with proven execution experience provide the highest quality and innovative solutions for secure and optimised process automation and management. The company’s global customer-centric focus together with strong local support reduces business risks and provides the lowest total cost of ownership – the hallmarks of a valued and dependable automation partner. OpreX is the comprehensive brand for Yokogawa’s industrial automation (IA) and control business. The OpreX name stands for excellence in the technologies and solutions, cultivated through the co-creation of value with customers, and encompassing the entire range of IA products, services, and solutions. One of the product groups that make up the OpreX Control category is the OpreX Control and Safety System family, which includes the Centum VP DCS. With its various OpreX Control solutions, Yokogawa is able to effect changes for its customers that lead to a transformation in such areas as management and operations, and provides highly reliable control technology that ensures high efficiency, high quality, and safe and stable plant operations.